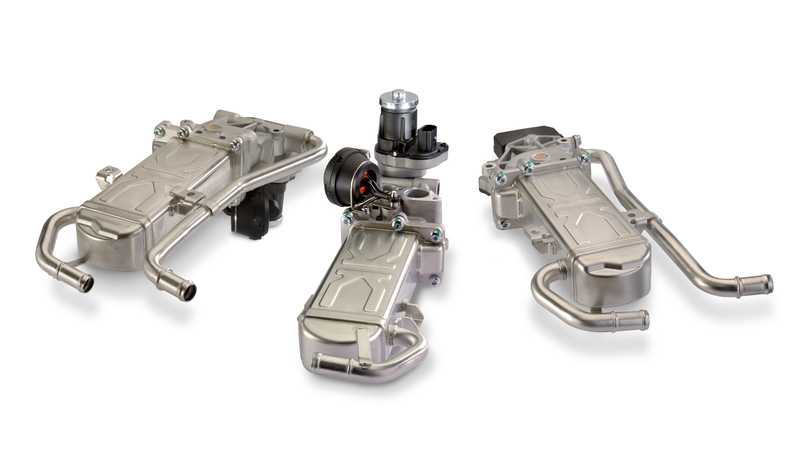 MS Motorservice International GmbH has expanded its product portfolio with three new EGR cooler modules. They cover a wide range of Volkswagen AG passenger car models with diesel engines. The new EGR cooler modules in OEM quality thus open up a market potential of over 8 million vehicles. The basic requirement for a long-term repair solution is that the components of the exhaust gas recirculation (EGR) are coordinated precisely with each other and the relevant engine. For this reason, it is advisable to replace worn or faulty components with an equivalent spare part. Although the components involved in exhaust gas recirculation are not traditional wear parts, a failure may still occur during the life of the engine. Many people also visit the nearest repair shop in the event of typical symptoms of a malfunction in the EGR system such as black smoke, loss of power, poor idling or inadequate acceleration. After all, each malfunction leads to loss of power, meaning that a repair is inevitable. The new EGR cooler modules from Motorservice with the item numbers 7.09720.00.0 to 7.09720.02.0 offer an effective solution here. They reflect the current trend for compact modules with integrated EGR valve and bypass flap. They also impress with reliable functionality and a high-quality stainless steel housing: After all, they are subjected to extreme conditions with aggressive exhaust gas condensate, temperatures up to 700 degrees and pressures up to 3 bar. The all-rounders also score highly when it comes to usability: This means that they can be used for over 8 million passenger cars with diesel engines on vehicle models from Audi, Seat, Škoda and VW. As a sales organisation for Rheinmetall Automotive's aftermarket activities, Motorservice acquires a large proportion of its range internally from within the group, including the subsidiaries Kolbenschmidt and Pierburg. The internationally active spare parts specialist also has the know-how of a large international automotive supplier. Customers therefore benefit from products in OE quality. Cooled exhaust gas recirculation reduces the oxygen content in the air-fuel mixture by adding exhaust gas, and therefore decreases the combustion temperature in the cylinders. Since harmful nitrogen oxides (NOx) predominantly occur at high temperatures and pressures, NOx concentrations can thus be reduced by up to 50 per cent – before they are released into the environment. The formation of soot particulates is also decreased by approx. 10 per cent in diesel engines through exhaust gas recirculation.